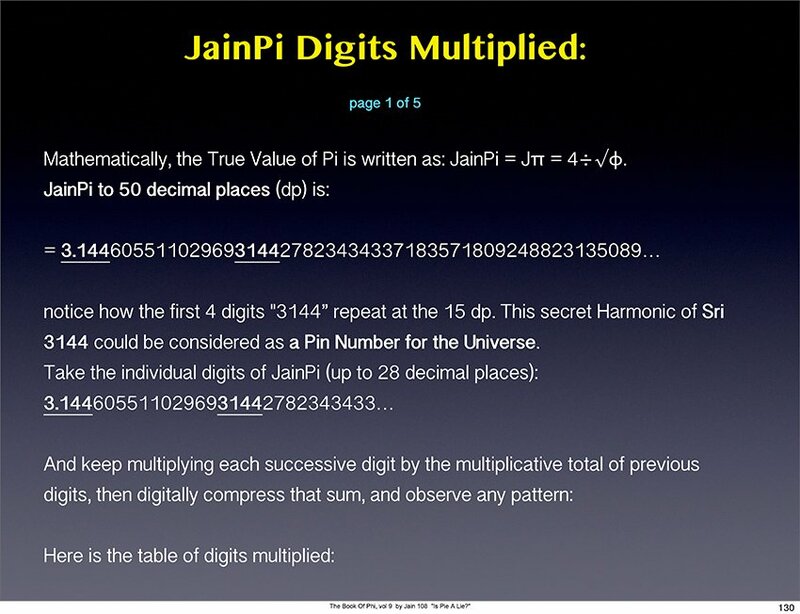 1) Jain Discovered a distinct 24 repeating pattern in the Phi Ratio 1:1.618033… traditionally understood as a Transcendental irrational number that goes to infinity without any known pattern. Recorded, in my latest series of books: THE BOOK OF PHI, The Living Mathematics of Nature. Volumes 1 and 2. 2) I discovered a better way for defining the formula for “e” = 2.71828454590 etc. This is the Exponential Number for nature’s growth and decay. “e” is the mathematical constant that measures the growth of human populations or viral colonies. It appears to act like the Phi Ratio, but is another separate entity, and is as important. 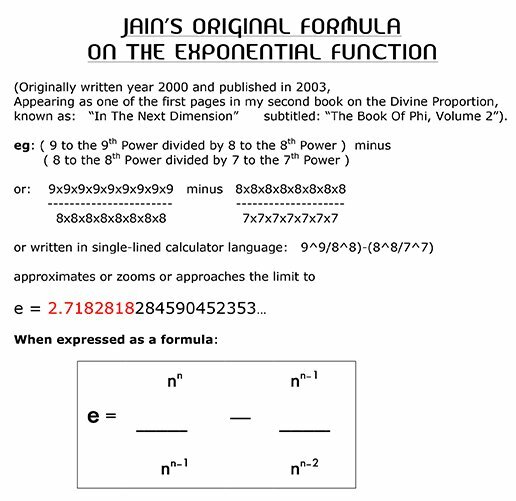 Published briefly in “In The Next Dimension” aka The Book of Phi, Volume 2, by Jain.- I Contributed two important Mathematical Discoveries. 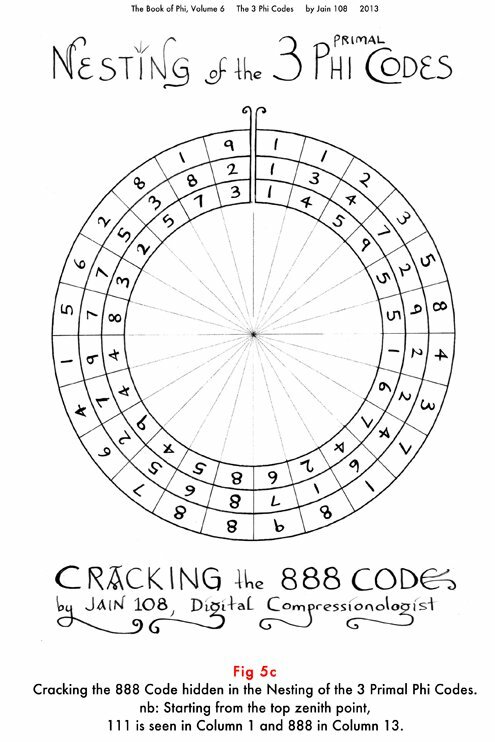 3) Jain 108: Jain has contributed many original and unpublished sequences based on the mathematics of Digital Compression. 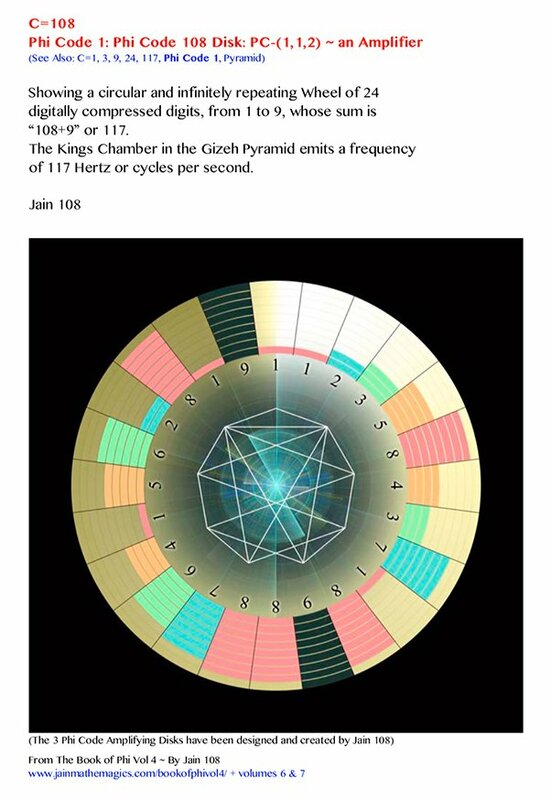 6) Jain’s main mathematical enquiry or research is to prove that the Golden mean (Phi 1:1.618…) connects all systems, whether it be biological, mineral, crystal, space, atom. eg: Phi is in the 3-4-5 Pythagorean Triangle. Phi is in the Equilateral, Phi is in 3 tangential circles etc. 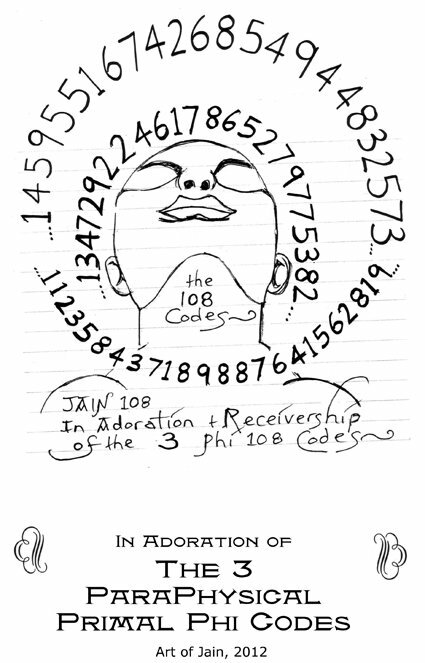 Jain can demonstrate that Phi is in Binary Numbers (1-2-4-8-16-32), Phi is in Prime Numbers, etc. In fact, the True value of Pi is based on Phi, based specifically on the square root of Phi which is 1.272, that which Squares The Circle. Jain’s life’s work is to show that the Golden Mean underpins all creation and is part of all mathematical and biological systems. The Origin or mathematical derivation of the Sri 108 Code based on the Infinitely Repeating 24 Pattern of the Digitally Compressed Fibonacci Sequence. 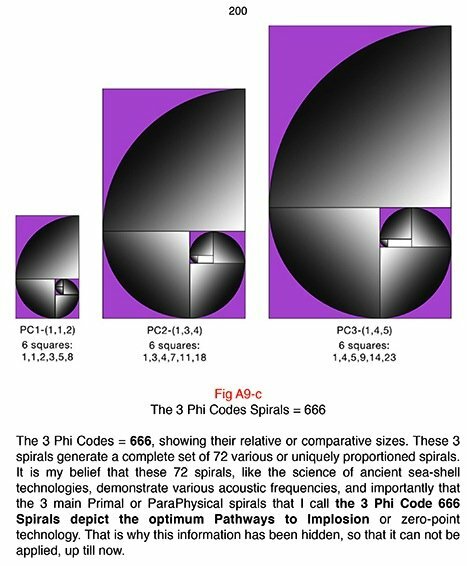 (from: The Origin or mathematical derivation of the Sri 108 Code based on the Infinitely Repeating 24 Pattern of the Digitally Compressed Fibonacci Sequence). Observe the “111” at the top of the wheel, and this is diametrically opposed by “888” at the bottom of the wheel. “888” is the sacred Asian Number, and is revealed in the structure of the digitally compressed 3 Phi Codes that each sum to 108. 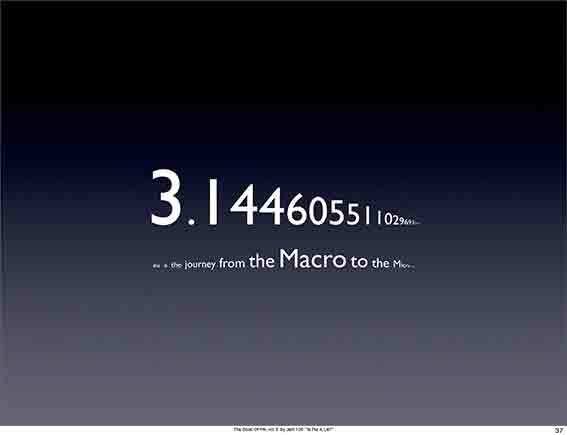 The Pervasiveness of Phi (1.618033988…). Jain can mathematical show that Phi is in all important systems, in biology, in crystals, in space, in atoms, and mathematically it is seen everywhere in the Doubling Binary Sequence (1-2-4-8-16-32-64), in the Pythagorean 3-4-5 Triangle, surprisingly in the Equilateral Triangle, in Magic Squares, in Prime Number Sequences etc. 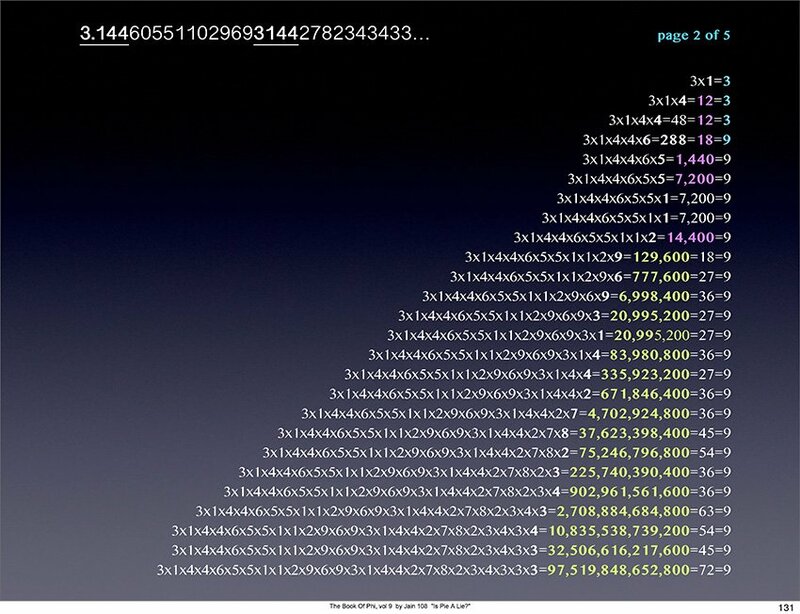 The True Value of Pi = 3.144605511029693144… based on the Square Root of Phi (1.272… which is the Height of the Cheops Pyramid in Gizeh, where the 4 sides of the base divided by the height give this value: 4 divided by 1.272… = 3.144…). 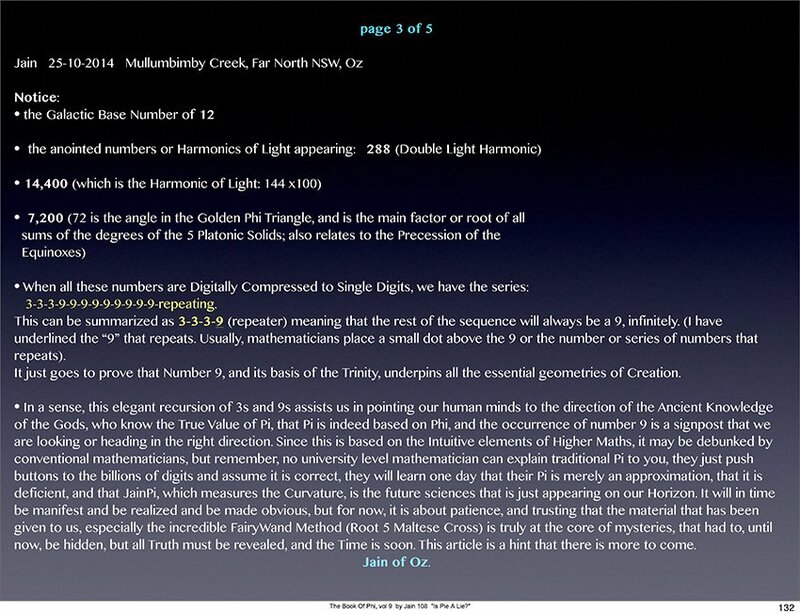 The mathematical connection between The True Value of Pi and the Harmonic Speed of Light “Harmonic 144”. The Radian has a new value, based on the True Value of Pi. JainPi Radian = 57.24… degrees and the traditional Radian = 57.29… degrees. The radian is the radius of the circle measured over the curve of the circle, more accurate or universal than the artificial 360 degree division. New Formula for “e” the Exponential Function, more simple than Euler’s (pron. “Oiler”). “e” is like Phi, that is about biology and growth, but appears in the microscosmic measurements of evolving populations of human or viral colonies. It could be said that Tesla’s profound discoveries on light, electricity (alternating current), radio, TV, radar, energy,Â etc redefined if not invented the 21st Century. we can collectively move forward, when the great Mind of no Ego is equalled to a great Heart full of Compassion for all Sentient Beings. Dedicated to the Late Bruce Cathie who instructed me to take more notice of the 360 division of the circle, (‘cos last decade, I was ranting that it was artificial and a mere man-made invention compared to “radians”, now I understand that the Master was right). Here is another mathematical testimony to the Circle Harmonic of 360 (degrees) as glorified by the late Bruce Cathie. 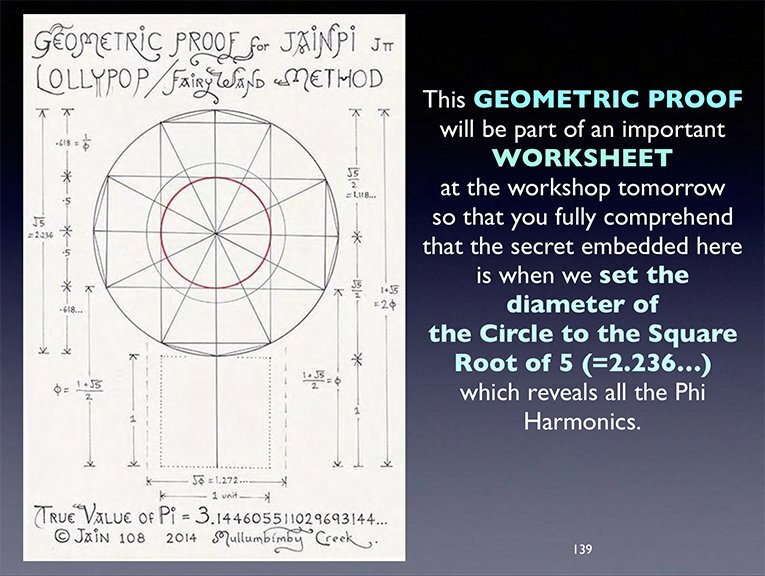 What follows is my own original insight, that connects the 360 degrees of the Circle to the wonders of Phi (1.618…). We already know that the Golden Pythagorean Right-Angled Triangle, existing inside the guts of the Cheop’s pyramid in Giseh has sides (1, Root Phi, Phi) or (1, 1.272, 1.618) and angles of (90, 51.8, 38.2). The diagram shows the yellow shaded square areas of these 3 sides are (1, Phi, Phi Squared) or (1, 1.618, 2.618). Metaphysical Scholars all talk about this important and critical slope angle of the pyramid’s 4 triangular faces being 51 degrees 51 minutes or 51.8 degrees and many a thesis and many tomes of great literature have been written about this revered angle, such as “Harmonic 51-51” and deservedly so. Though, my insight is the other angle, the neglected 38.2 degrees, how I will directly and boldly relate it to Harmonic 360. How? Up till now, no-one has written about this. First we need to know about the Reciprocal of Phi (1.618) is 1/Phi = phi with a small “p” = .618. Thus Phi = 1.618 and phi = .618 is the Reciprocal. (To mathematician’s astonishment, Phi is the only number in the universe that when you take away its reciprocal, it equals 1 or Unity Consciousness. And if you add 1 to Phi, you get its square. This has huge implications in the Future Sciences and is why it is called the Golden Number, and why people like myself have studied it tirelessly for 3 decades). 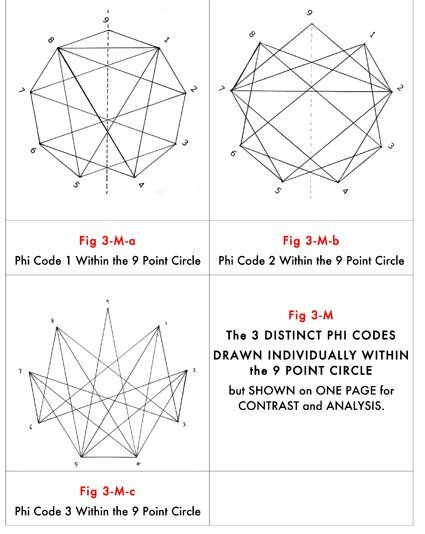 If we ask “What is phi of phi?” we are asking what is 1/Phi x 1/Phi or phi x phi or .618033988… x .61803988… = .38196601… = .382 rounded off to 3 dp or decimal places. (This format of 3dp has been adopted for the whole article, but just remember that these decimals are running forever without any known recursion or repetition). This anointed value of .382 is also known as “phi squared” or the Reciprocal of Phi Squared or 1/Phi^2 or 1 divided by 2.618. Notice also that the square area of the hypotenuse or the longest side is also 2.618 square units or 1.618 x 1.618. Lets store this value of .382 into our Inner Mental Screen, and recall it soon when we need to. Let us now take our attention to the smaller and topmost angle in our diagram. It is 38.2 degrees (simplified by rounding off 38.17 degrees to 38.2 degrees). Can you see the connection between 38.2 and .382? even though one is in degrees and the other is a linear measurement, it doesn’t matter what the format is, in cross-platform Harmonic Mathematics where whole integers sing their universal songs. This 38.2 degrees is a Phi Harmonic, is indexed against the Circle Harmonic of 360 degrees. In the timeless, universal Language of Harmonics, we have poetic license or permission to slide the decimal point and also discard any zeroes before or after the decimal point. (eg: The Reciprocal of Light Harmonic as given to us via Bruce Cathie the Father of the Earth Grid is 1 divided by 144 = .0069444… which rounds off to .00695 which simplifies to Harmonic 695. It may appear nonsensical that this is the case, but trust me, this is the key to Star Trek knowledge, how to map the sphere and galaxies and thus travel safely at warp speed). 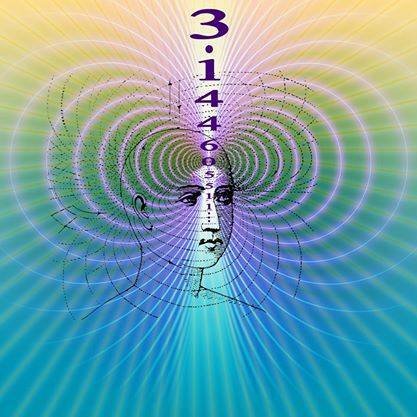 Thus, to conclude, I am making the distinct relationship that 38.2 and .382 are of the same family of Vibrational candidates that marry the Tribe of Phi with the Tribe of 360, interlinking the Mysteries of Pine Cone / Sunflower Mathematics to that of Circle Harmonics. We learn from this ancestry.net that they have always been cousins, always connected, it is only us that had forgotten our lineage. We therefore give thanks to the beauteous and restorative Language of Mathematics and treasured Sacred Geometry that guide us to Remember Who We Are and Where We Have Come From! 360/51.84 = 6.944444444444444 Bruce Cathie’s 695 harmonic. 1 divided by 144 = .0069444444444…. One important and not well known aspect of the decimal angle of the Great is that 360 degrees is broken down into mins & secs of arc. That 51.84 x 60min x 60sec = the Speed of Light in miles/sec 186,624. (information sourced from researcher Trevor Ward of Western Australia). Thus we can conclude that the critical base angle of the Great Pyramid encodes the Maths of Light! Meeting with Kranti Kiran (at Hyderabad, Andras Pradesh state), aged 29, the top and foremost Vedic Mathematician genius in all of India. We taught at many schools like Nalanda, Chaitanya, Warangal. Kranti instantly organized 400 people involved in Infosys, Hi-Tech City, to attend one of my lectures. This was the first standing ovation I had received, an honour as the audience was the cream of India’s Mathematical elite, and they were stunned that a westerner like me had educated them on the origins and fascination for their holy number “108” which was a mystery to them, but I explained its coding hidden in the 24 repeating pattern hidden in the Fibonacci sequence. They therefore support my efforts towards the much required fibonaccization of the global mathematics curriculum that I am currently writing.